One of my latest infatuations is splatterware (aka spatterware). It’s the perfect thing for bridging the gap between modern and traditional. Right now abstract art is hot, and splatterware is the ultimate in abstract. But it’s also been used for, oh, 300 years, so it feels traditional too. via—pair splatterware with lettuce-leaf majolica, and I want to die. I love this black-and-white splatterware pot on my stove. It’s so graphic and fun and is a lovely foil to the antique artwork. If you’re the type who would rather set the trends than follow them, splatterware is a great place to start. You’d be hard pressed to find many photos of splatterware in kitchens online, so go forth and start a movement. I’ve started looking for graniteware for my mother-in-law, who has a nice collection of pewter already going. Graniteware fits right in and adds another texture but in a subtle way. It hasn’t caught on as trendy yet but works nicely with a neutral color scheme. It’s plentiful in antique stores and on Etsy too. Next Poll time! Barbershop A or B? I love that top picture! And the grey! 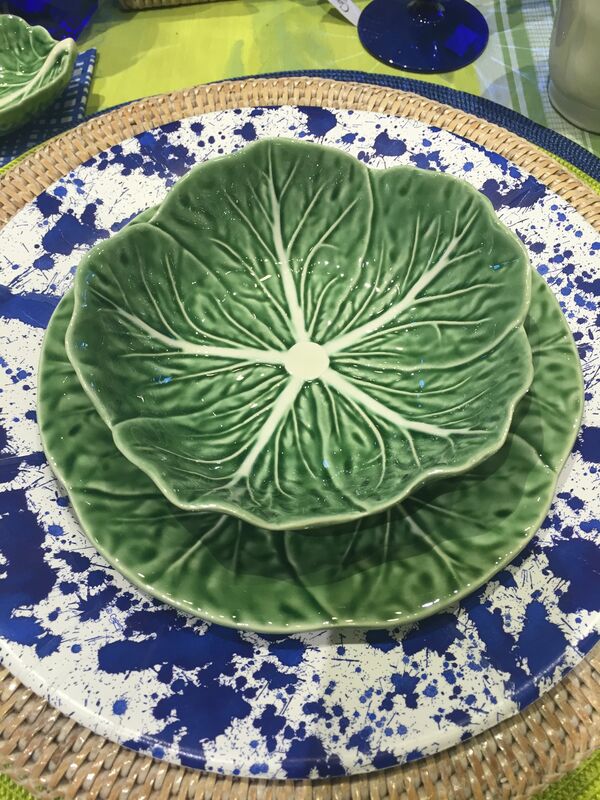 The splatterware with lettuce-leaf majolica really is gorgeous, would you display is somewhere or use it? I love your stovetop! You have stuff on your counters but it still looks clean. I would display it but also use it for fancy meals. Wouldn’t it be pretty for Easter dinner?